Coordinators: Pardeck John T., Murphy John W.
Microcomputers have the capacity to do great harm as well as good and a full explanation of the technical and philosophical issues involved will be of interest to a number of disciplines. Other topics explored are ? the potential uses of microcomputer-technology in early childhood education and current research and theory building on microcomputers and early education. This book should be read by teachers, sociologists, psychologists and researchers in education. Introduction to the Series Roy Evans. 1. 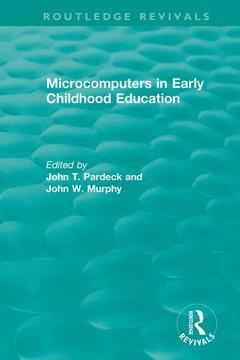 Introduction: Microcomputers in Early Childhood Education John T. Pardeck and John W. Murphy 2. Microworlds, Mother Teaching Behavior and Concept Formation in the Very Young Child Daniel Shade and J. Allen Watson 3. A Developmental Study of Children’s Computer-Aptitude and Knowledge About Computer Technology Barbara Burns and Elizabeth Ferguson 4. Assessing Microcomputer Competencies for the Elementary Teacher: An Indepth Study of Illinois Schools Robert C. Morris and Eugene Meyer 5. Young Children’s Interaction with a Microcomputer Steven B. Silvern, Peter A. Williamson and Terry M. Countermine 6. Using the Computer for Early Childhood Screening, Writing Objectives, and Developing Local Norms/Records Carol Mardell-Czudnowski and Dorothea Goldenburg 7. The DAISEY Data System: A Computerized System to Support Longitudinal Research Garrett K. Mandeville, Gail I. Raymond and Lorin W. Anderson 8. Computers and Cognitive Development: A Preliminary Statement John T. Pardeck and John W. Murphy 9. A Critical Look at Children and Microcomputers: Some Phenomenological Observations Larry W. Kreuger, Howard Karger and Kathy Barwick 10. Computer Use with Young Children: Present Perspectives and Future Possibilities Philip B. Waldrop 11. The Technological World-View and the Responsible Use of Computers in the Classroom John T. Pardeck and John W. Murphy. Index.